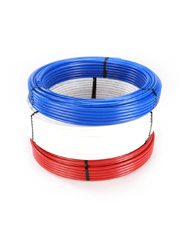 All CANPEX UV Plus tubing is marked with the name CB Supplies as the manufacturer, nominal size, plastic tubing material designation code PEX 5306 (indicating that the PEX tubing has been tested and meets the F876 requirements for minimum chlorine resistance at the end use condition of 100% @140°F), design pressure and temperature ratings, relevant ASTM standards, manufacturing date and production code, as well as NSF-pw stamps (indicating third-party certification by NSF International for meeting and exceeding performance and toxicological standards, as well as achieving the highest chlorine resistance rating in the PEX industry). NSF conducts random on site inspections of the manufacturing facilities and independently tests CANPEX UV Plus tubing for compliance with physical, performance, and toxicological standards. CANPEX UV Plusis also certified to meet the Uniform Plumbing Code, NSF 14/61, NSF Annex G (Lead Free), CSA (Canadian Standards Association)B137.5 (cNSF), ULC/UL (Underwriters Laboratory) S101/UL263 and ULC S102 through Warnock Hersey. Cross-linked polyethylene (PEX) pipe is flexible, durable and proven through more than 30 years of use throughout Europe in hot and cold potable water distribution systems. CANPEX™ UV Plus is the latest innovation in PEX tubing which takes all the benefits of typical multi-layer tubing and combines them all into a single-layer UV resistant PEX Pipe with a class leading PEX5306 listing and certification. CANPEX™ UVPlus’ advanced formulation ensures that when the product is exposed to UV radiation, it will retain both its physical properties, as well as its long term Chlorine/ORP resistance at the highest level in the industry today. Translation: you don’t need a black layer to ensure UV and Chlorine protection. Safe, chemical-free installation and Lead-free! CANPEX™ UV Plus tubing connected using Poly-Alloy (a polymer made of engineered plastic resin) insert fittings is one of the fastest joining systems in Canada & the U.S. CB Supplies carries a full line of PEX tools and accessories to complete the most demanding PEX installations.CANPEX™ UV Plus is CTS-OD sized (copper tube size, outside diameter controlled) with an SDR-9 (Standard Dimension Ratio) wall thickness which yields maximum pressure/temperature ratings of 100 psi @ 180° F and 160 psi @ 73° F. CANPEX™ UV Plus is manufactured by a third party entity certified to ASTM F876 and F877. For applications not listed, consult a CB Supplies representative. CANPEX™ UV Plus tubing is a superior alternative to copper for plumbing systems.